Fake Christmas trees are, in a word, easy. You take them out of storage, assemble them in a matter of minutes, and stand them up – job done. But they don’t capture the spirit of Christmas like a real tree that you’ve chopped down yourself. It might be the smell, the natural look, or the fun outdoor experience of hitting the frosty winter woods and finding the tree with your family. Whatever the reason, real trees are for many outdoor enthusiasts and regular folks alike the only way to do true justice to the Holiday season. There’s a bit of a learning curve to finding, cutting, and using a real tree though, so check out the following guide before hitting up your local tree farm this season. First and foremost, be sure to measure the clearance that your potential Christmas tree will have in your home. Nothing’s worse than putting in the work to chop down and bring home a tree that scrapes the ceiling or is underwhelmingly short. When you’ve made the measurement and are ready to head to the tree farm, remember to bring a reasonably high quality hand saw, as many don’t provide tools for you to rent. In addition, you can expect to pay a base fee in the teens for each tree, plus an additional cost per foot. 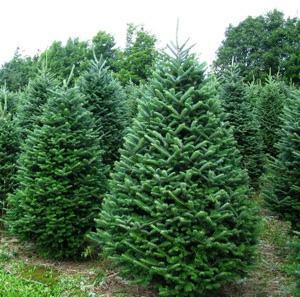 Check your local tree farm’s web site to verify the total cost. Finally, be certain to bring your spouse and kids along. Chopping down and bringing home a real Christmas tree is a tradition for many families during the holiday season. In a way, it is seen as a Yuletide kickoff that both kids and parents look forward to every year. A decent sized Christmas tree can be a bit of a pain to transport. Though they’re generally light enough to be carried by one or two people, their bulk and awkwardness makes it tough to get them anywhere easily. If you own a pickup truck, the best option is usually to set it in the bed, leave the tailgate down, and tie the tree down. An alternative option for SUV and minivan drivers is to string bungee cords through the windows and over the tree to secure it. No matter what your method of transport, it’s a good idea to bring along gloves to protect your hands. Though the pine needles themselves aren’t all that sharp, the tree’s trunk is often rough and knotty. You know those old Christmas tree stands that have three legs and a shallow base? They stink. Before you go out and get a real tree, invest in a high quality cone shaped tree stand. It will save you a ton of trouble in setting up and decorating the tree, and might even prevent a fall as the season goes on. The easiest method for getting the tree up involves two people. One holds the tree on its side as steady as possible, and the other secures the stand’s screws to the base of the trunk. The method is trial and error based, so if you stand the tree up and it has a noticeable lean, don’t hesitate to start the process over. Going to the tree farm is a fantastic family activity in that it combines the outdoors with a delightful seasonal feel. Though it certainly takes more effort than dragging the old fake tree out of the basement, the experience is likely to become a fun and festive family tradition if you get it started this year. Plus, gazing at a beautiful natural tree decked out in lights and tinsel in your home is well worth the effort.